Paonias myops - Hodges#7825 (Small-Eyed Sphinx). Size: approx. 50-60 mm. Photo: 05/25/11. The husband of my sister-in-law took this photo (thanks!). This strange looking moth is a small-eyed sphinx - Hodges#7825: Paonias myops. This Paonias species is one of three in the US. 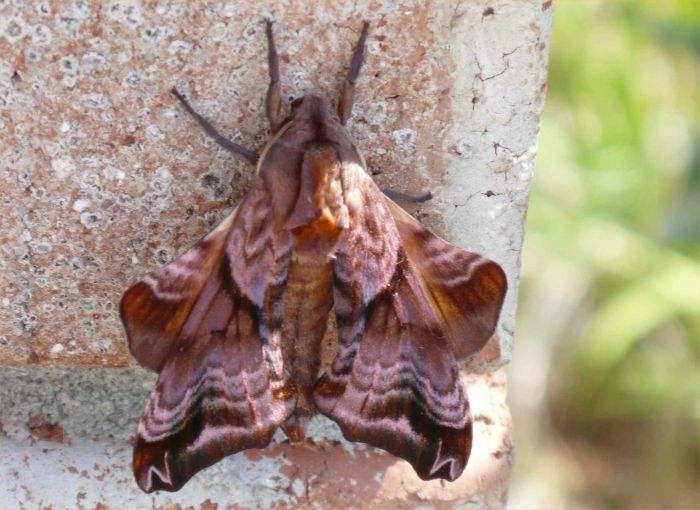 Some sphinx moths can fly with speeds of up to 30 mph and are also able to hover in midair. P. myops can feed on hawthorn and plum trees which we both have in our yard. This specimen measures close to 2'' and tries to blend into the brick facade of our house.